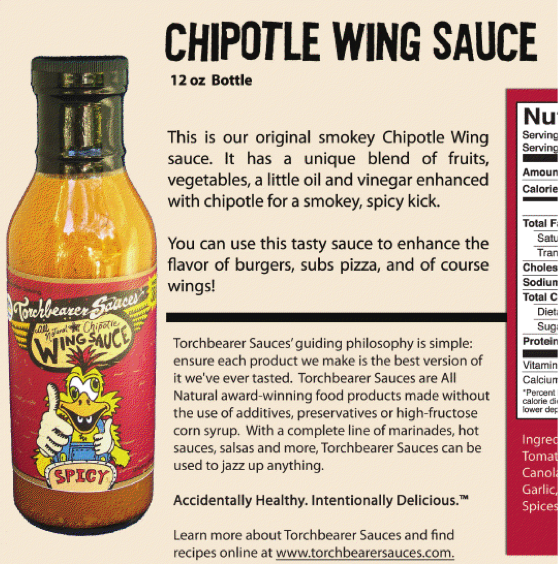 On our final day of Week of Wings II we bring you a very unique looking and tasting sauce from Torchbearer Sauces – their All Natural Chipotle Wing Sauce. Marilyn: The first flavor I got was the smokiness of the chipotles, which I loved. It’s a very unique flavor – not what you would expect in a wing sauce. This is a warm smokey sauce with lots of levels of flavor. I really didn’t taste the Mandarin orange at all. Brian: I expected a mustard type profile because of how much it looked like Dijon, so my eyes deceived me. It tasted to me like a habanero wanna-be. There was the color, and the sweetness of the orange and carrots (which I found a little off-putting) but it did not deliver on the big hit of heat normally associated with orange / habanero sauces. There was little to no Chipotle smoke or flavor for me. Marilyn: Tons of texture going on, probably from the carrots. 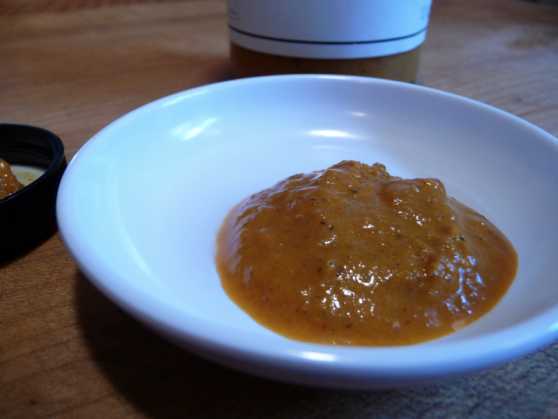 Despite the pale orange color, and despite the fact that its the color of Dijon mustard, this is NOT a mustard sauce – much to Brian’s dismay. The sauce does separate a bit on the plate – probably from all the Canola oil in it. Brian: I loved the chunkiness and texture of this sauce. Big bites of bits and flavors. 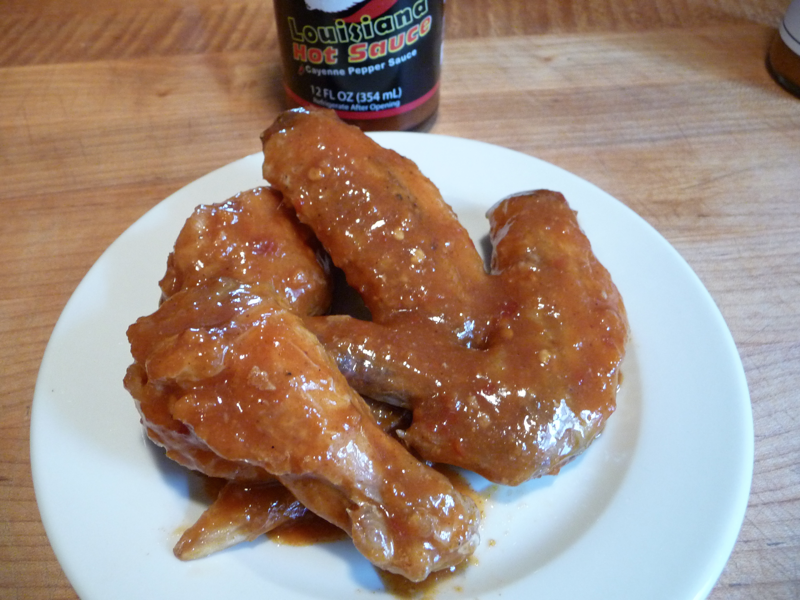 Marilyn: The sauce coated the wings nicely, but I don’t really taste the orange – my first flavor is still the smoke. The wings had a warm and smokey dark flavor. But the heat was just a medium. Brian: There was an odd flavor from the orange and carrots that coated my mouth. While there was some heat, there was no discernable smokey chipotle flavor. The chipotle is weak and needs more heat – isappointing as I love chipotle peppers above all others. Marilyn: Just a nice medium heat level for me. Brian: Not enough Chipotle heat, not nearly hot. Just a light – medium level. – Our bottle had the pre-production label on it. Here’s a shot of their current label, much more colorful and humorous – and informative! All of the graphics of their products are of the same, cartoony and colorful graphics. Nice job guys! – Mainly because we thought it could have a more pronounced Chipotle flavor. As different as it was as a sauce, it’s very unique and you have to decide for yourself. We hope you’ve enjoyed reading our Week of Wings II – be sure to check out our Week of Wings from last year too. On Day 6 of our wing roundup this year, we bring you a a review of Mama Bull’s Louisiana Hot Sauce Cayenne Pepper Sauce as a straight wing sauce. No butter added, we just followed the directions on the bottle to dunk the wings in the sauce! As a rule, I’m not a fan of Louisiana style hot sauces… but I’m getting there. 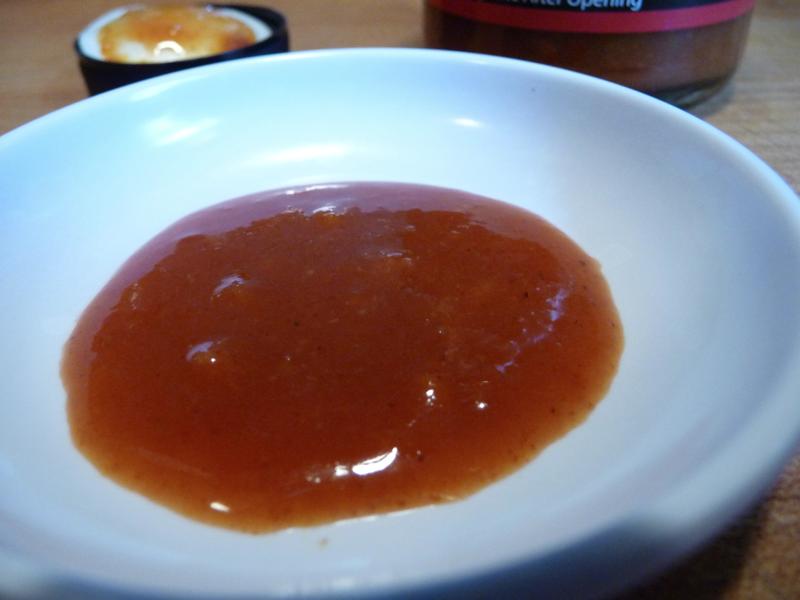 Check out our review of Swamp Scum or Louisiana Gold Pepper Sauce and you will see I’m becoming a fan. This review is another great example of how a Louisiana style hot sauce is inching me closer to liking them. Marilyn: There is a big hit of vinegar both through the smell and first taste. The taste is slightly sweet in a veggie way – probably the carrots. Brian: At first I thought this was a very traditional Louisiana sauce, but it’s bigger than that. The flavor really pops! Marilyn: I see crushed red peppers and seeds, and perhaps bits of garlic. At first I thought it may be too thin to cling to the wings, but it’s now setting up nicely and there is a thick coating on the wings. Brian: A thin sauce with bits of garlic floating about. I also see crushed red pepper flakes and seeds. 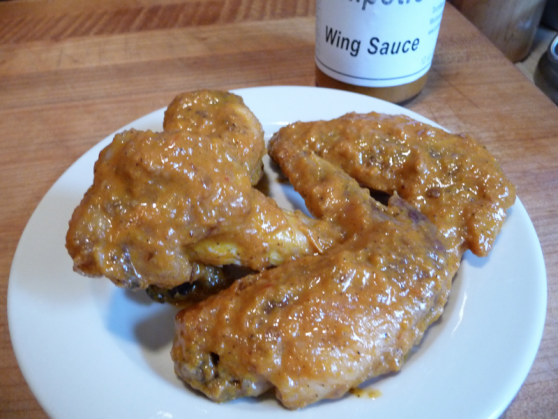 This sauce sets up nicely and clings very well to the wings. Marilyn: I taste vinegar first, then hot. Yes, hot hot… it’s burning my lips. Then I get a slower back of the throat burn. There’s a full flavor profile with the vinegar, heat and finally a nice warm depth of flavor. A winner with me. Brian: A very traditional Louisiana flavor, this is a good flavor bringing on a nice medium-to-strong heat. I’m digging it. I wish we had prepped this sauce with some butter for a traditional “Buffalo” style sauce… but we followed the instructions on the bottle that said to simply toss the wings in the sauce. Marilyn: Make no mistake, this sauce is hot! I already said it burned me right away. Brian first thought it was mild, but then it got hotter for him. Brian: Go figure. It was tame at first, but the more I ate, the hotter it got. I was surprised. And I grew to like it. I don’t think it was as good as other wing sauces we’ve reviewed here on HotSauceDaily.com but I would enjoy these at a local bar if they were their only offering. Just add beer! 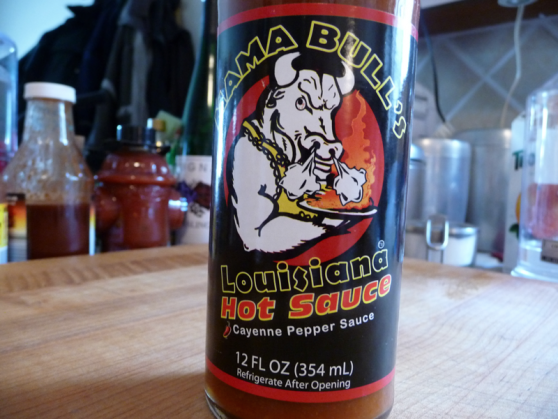 Label/Graphics: – As you can see from the pic of the label above, Mama Bull’s label doesn’t exactly stand out. The words “hot sauce” are the most prominent. I think the Bull should be more “Mama-like” and less “Bull-like”. The label is just so-so. And we reviewed their “hot” version as opposed to the “mild” version which they also offer. And here’s where you can get yourself some bottles of Mama Bull’s Sauces. Tell ’em HotSauceDaily.com sent you!